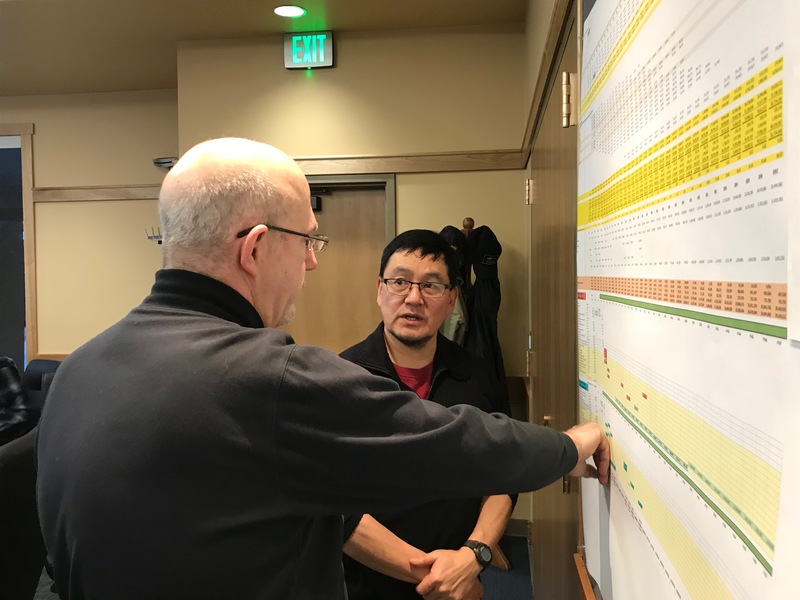 The Sitka Assembly has found a way to balance the budget, finding an additional $300,000 dollars for Sitka schools through a series of cuts and transfers. The surplus, approved by unanimous vote, could save some teaching positions. But it also means the landscape of other city services has been trimmed. The Assembly did not make any changes to the budget for the Enterprise Funds. While electric rates will stay the same, Sitkans will see all other rates will go up: 5.5% for wastewater, 6.5% for solid waste, 6.3% for harbors, and 22% for water. The steep water hike is because of the city’s desire to develop a secondary water source. Take a moment to remember the game Jenga. You know the one. Blocks are removed slowly from a tower, one by one, and re-stacked on top. Then everyone stands back to assess the stability of this new reality. It’s a painstaking test of balance and risk. Now, imagine you are playing on a team of seven in front of the whole town and you get a sense of what the Sitka Assembly signs up for every year when they try to balance the budget. This year, the Assembly pinched dollars from other places to find more money for the school district. Assembly member Steven Eisenbeisz wanted to convey just how precarious and challenging that was to the public. “That was an extremely painful process that we just went through, full of a lot of cuts and a lot of disagreement in order to find the school $300,000,” said Assembly member Steven Eisenbesiz at the end of Thursday nights’ four hour meeting. Here’s how they did it: $200,000 was unanimously cut from the $400,000 utility subsidization fund. That means qualifying households will receive less assistance on their utility bills when the utility subsidization program gets rolling next year. Another $200,000 was transferred into the general fund from the visitor enhancement fund. This troubled some Assembly members, given that Sitka’s visitor services contract with the Chamber of Commerce has expired and a new one is out to bid. Whoever takes up the contract may want more money next season. But the majority wanted to take the risk, voting the transfer through 5-2 with Richard Wein and Steven Eisenbeisz voting against. Now before approving this additional $300,000 to Sitka’s schools, everyone wanted to know: would teachers jobs be saved? Superintendent Mary Wegner then came forward. “My feet are fully blistered and bandaged up from all the walking,” she said, recounting a recent trip to Juneau to meet with lawmakers in the capital. During the fly-in, Wegner learned the legislature is looking to increase the Base Student Allocation. One unnamed senator estimated a BSA increase of $30 per pupil. Wegner told the Sitka Assembly that could spell good news for four non-tenured teaching positions she proposed the school board eliminate, should they not manage to close their deficit. Superintendent Mary Wegner: One [position] at each school, except for Pacific High School. Those would change the level of service we can provide our students and families. Assembly member Steven Eisenbeisz: And so those four are dependent on Base Student Allocation and a potential increase in revenues generated by this Assembly? The $30 BSA would only amount to an $80,000 increase. The School Board could still cut teacher positions at their final budget meeting on April 17th. Wegner also added that two other teaching positions will be cut no matter what, due to declining school enrollment and scheduling changes. How did the City of Sitka go from having a $1.3 million deficit a month ago to furnishing more money than last year for Sitka’s schools? It comes down to pulling Jenga blocks and making cuts. With City Administrator Keith Brady’s guidance, the Assembly approved several cuts at their budget meeting last week (04-05-17). That includes reductions of $18,700 from travel and training for staff, $150,000 from upgrades to the Crescent Park bathrooms, and $316,724 in savings through financing the purchase of a new CAD/RMS and phone system for the police department over a five year period. Department heads previously offered $869,915 in cuts during budget negotiations at City Hall in March. The Assembly did tiptoe to the edge Thursday night of restoring one thing to the budget: $100,000 to hire an assistant fire chief. Al Stevens, who retired from that position, has been working part time at the Fire Hall to help out. After careful debate, the Assembly voted that down 2-5 with Knox and Miyasato voting in favor. The majority said they simply couldn’t afford an assistant fire chief position though it pained them to make that choice. Some services on the chopping block, however, were spared. The wages of temporary workers will not be reduced. Mayor Matthew Hunter made the point that temps save the city money in the long run. “You’re getting a lot more bang for your buck out of these folks for temporary projects. If you need to do something on a short term basis, hire someone for a couple of months and get it done,” Hunter said. The Assembly also included $25,000 in the budget for the RIDE public transit system. A motion made by Aaron Bean to cut Assembly stipends (they each earn $350/month) failed 2-5, with Richard Wein voting alongside Bean. Following the meeting, City Controller Melissa Haley told KCAW the FY19 General Fund budget has a surplus of $131,381. The Sitka School Board will finalize their budget at their April 17th meeting. They will then submit their budget to the Assembly for review. The Assembly’s budget ordinance – a document approving the FY19 budget – will come up for first reading at their regular meeting on May 8th.